Als u onze website gebruikt, gaat u ermee akkoord dat wij cookies gebruiken volgens ons Cookiebeleid. How Sporting KC’s culture of technology turned their search for a ticketing platform into a game changer—on and off the field. 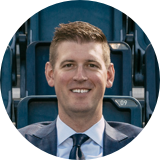 Sporting Kansas City is an MLS team focused on innovation and excellence both on and off the pitch. As the league leader in customized one-to-one fan interaction, they’ve pioneered amenities such as hi-def outdoor wifi and custom app enhancements like dynamic stats, personalized offers and seat upgrades. Time and time again Sporting KC has set the bar higher for what match day can be. And the fans respond in kind: the team is capped at 12,000 season ticket members every year and creates a waitlist to keep up with demand. To constantly improve the symbiotic relationship between the club and their fans, SKC makes every effort to be transparent about their decisions and listens to feedback, both positive and negative, from the people that support the club every game. The vocal fan base helps the team iterate, improve and stay true to the spirit of innovation. SKC wanted to bring their spirit of innovation to ticketing. More specifically, they wanted to upgrade and enhance their fans’ experience in a way that was exciting to both season ticket holders and prospective fans. They decided to search for a solution that seamlessly integrated with the platforms and experiences familiar to current fans. And to attract new fans to the stadium, they explored unchartered ways of distributing their tickets. Putting tickets on new platforms and with non-traditional partners meant SKC would be able to grow their customer database and drive incremental sales, especially powering the sales of Standing Room Only seats that are available for each match. Inspired by the team’s 2016 motto, “All For The City,” Sporting Kansas City combined their fan-first vision with SeatGeek’s ticketing technology. In the Uphoria app, where fans could already find essential match day information, they were now able to see, purchase, and transfer tickets. The transition to a mobile-first platform required education and communication with fans, but mobile transactions and game entries quickly increased—clear evidence of adoption and satisfaction. SKC was also the inaugural client to use SeatGeek's open distribution network, leveraging Facebook and other off-platform channels as a way to expand their ticketing reach beyond traditional means, bringing new fans into the stadium. "This is the future of ticketing."